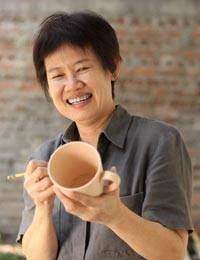 Working in celadon ceramic with its distinctive textures, Duangkamol crafts a finely detailed vase. Golden brown foliage covers the deep green vase in stately symmetry. 17 cm H x 7 cm Diam.